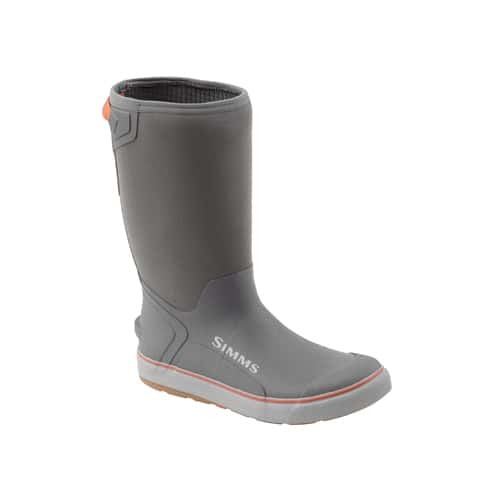 Simms Challenger Pull On Boot 14"
Nobody wants to have wet feet while working or fishing on a boat deck. The Simms Challenger Pull On Boot 14" is a very innovative Simms boat deck boot that is perfect to wear while you are fishing on boats. This Simms Challenger Pull On Boot is constructed with a Right-Angle Footbed to provide comfort and support on the boat deck. The Simms Challenger Pull On Boot is made with siped non-marking rubber outsole for maximum slip resistance that is a wonderful feature of this very innovative and feature-rich Simms Challenger Pull On Boot. The Simms Challenger Pull On Boot is also designed with a grid fleece lining, vulcanized rubber upper and reinforced rubber overlays to make this a rugged and durable boot to keep your feet warm and dry, so make sure to check out this new Simms Challenger Pull On Boot today from the Platte River Fly Shop.